In this photographic alphabet, the author introduces young readers to some of the customs, religions and cultures - both ancient and modern - that make up this fast-developing country. Focusing on both city and country life, this is a celebration of Pakistan in all its aspects, from dhobi to jasmine, from hijab to water buffalo. P is for Pakistan By Shazia Razzak with photographs by Prodeepta Das is a great way to introduce children to another culture whilst familiarising them with the alphabet. 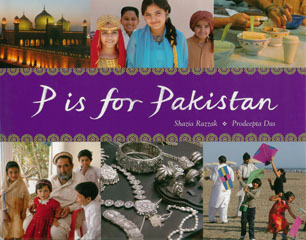 P is for Pakistan By Shazia Razzak with photographs by Prodeepta Das is available to buy now.